A large part of the discussion centered on the Medicare Savings Plan (MSP) and the legislature working in a bipartisan way to restore MSP after Gov. Dannel Malloy vetoed the bill earlier this month. 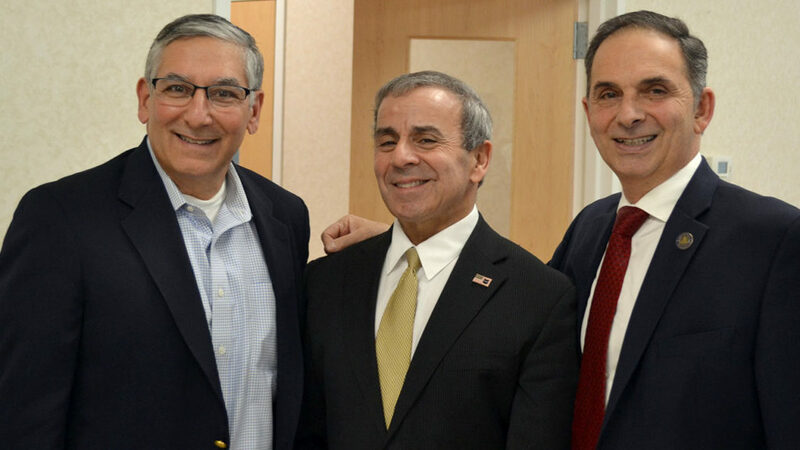 (l to r): State Sen. Len Fasano, First Selectman of North Haven Micheal Freda and State Representative Dave Yaccarino at the North Haven Senior Center, located at 189 Pool Rd., on Friday, January 26, 2018. On Friday, January 26, 2018, Rep. Yaccarino and Sen. Fasano held a Senior Update at the North Haven Senior Center, located at 189 Pool Rd., in North Haven from 11:30 a.m. to 12:30 p.m.
A large part of the discussion centered on the Medicare Savings Plan (MSP) and the legislature working in a bipartisan way to restore MSP after Gov. Dannel Malloy vetoed the bill earlier this month. The legislators vowed to keep residents informed and up-to-date as information unfolds at the Capitol with the 2018 legislative session commencing on February 7. As of right now, the portion of MSP that helps pay for prescriptions is still funded until December of 2018. As far as the Medicare premium and cost shares, that portion will be paid for until June of 2018. The legislators also stated that they hope to come back into special session to take up the MSP override by Wednesday, January 31, to take action and overturn the governor’s veto. This meeting was an opportunity for residents to express any concerns they may have and to ask questions about specific pieces of legislation or issues that affect Connecticut seniors.